The country of Palau is in the process of creating a new coral reef law, and considering Rights for Reefs! Were you interested in our webinar but unable to attend? Here is the PDF and recording on a new ecocentric formula for reef protection. Contact mbender@earthlaw.org to learn more, or if you are interested in exploring how to implement this approach where you are. Coral reefs cover less than 1% of the ocean, yet provide habitat for a quarter of known marine species. These highly biodiverse and breathtaking ecosystems face threats including: ocean acidification and warming, pollution, tourism and overharvesting. 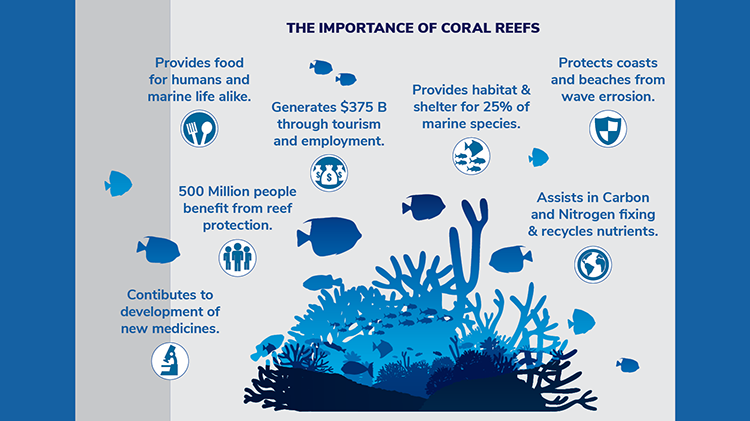 While scientists say we have lost half the world's coral reefs- WE CAN STILL SAVE HALF! How can we ensure proactive restoration, reduce greenhouse gas emissions and protect coral reef habitat? The constraints to traditional market-based approach include the seemingly unlimited access (e.g. tragedy of the commons economic idea), a system of property rights, and relying on the political process to determine the optimal level of reef protection. We are building a new innovative approach to reef protection that moves beyond traditional management schemes and market-based approaches; from ownership of the reef toward responsibilities to the reef. Evolving the idea of “insurance” for coral reefs to include Earth Law provides a way to save the remaining coral reefs. Think of it like this: we take the reef out of the realm of property and insure the reef for the benefit of the whole ecosystem (that includes humans). This approach can not only include payouts from local businesses, restrictions on use, and programs for restoration, but also requirements for local industry to reduce emissions and land-based pollution. Partners in this endeavor include Howell Conservation Fund and ReefLife Restoration. If you would like help protect a coral reef ecosystem, contact Ocean Rights Manager Michelle Bender at mbender@earthlaw.org.